Few fans can pinpoint their first exposure to Harry's music as closely as Bill Pere. "It was 1972 and I was doing Summer school at Bucknell," he said. "I was in from Hurricane Agnes and working with the Red Cross when I heard 'Taxi.' I was mesmerized by this story for seven minutes." Harry's ability to tell great stories through songs continued to have an impact on Pere both personally and professionally. "I followed his career and saw him perform at least once a year. When I learned about his involvement in social issues, it increased my respect and admiration for Harry," said Pere. "He showed how one person can make a difference." It was that admiration that later inspired Pere to found the Local United Network to End Hunger (LUNCH), an organization that will celebrate its 15th anniversary in 2004. "Back in 1989 I knew that the 10th anniversary of Harry's death was coming up in '91, and I wanted to do a memorial event. I put on a Harry Chapin legacy show that was designed to be a one-time event," he said. "I talked with others who were touched and influenced by Harry. Corporate sponsors came through and so did individuals. It was a success and raised more than $20,000." When people asked Pere when they would do it again, the idea for LUNCH came to him while driving down a road. 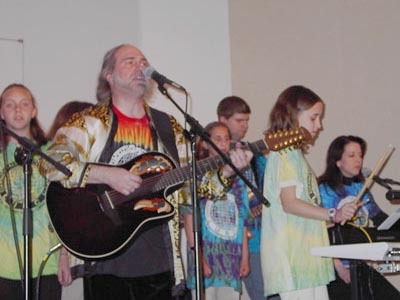 The main activity of the LUNCH program is the performance of family shows by an ensemble cast including members of the Connecticut Songwriters Association, under whose umbrella they operated for the first few years, and students from grades four through twelve. 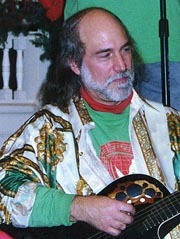 The all-volunteer program features concerts and performances of original skits and plays formed around Harry's songs as well as Pere's original songs. Participation is free and open to all regardless of ability. Since its inception, LUNCH has raised more than $300,000 through shows and sales of the 13 CDs it has created. Proceeds are used to keep the programs going and to provide direct support to 20 social service agencies and World Hunger Year, which was co-founded by Harry. An integral part of the program is teaching the kids about Harry's example of generosity and social action in the belief that through arts and education they will develop into the kind of leaders who will work toward social justice. "Once or twice a year we do a full stage play with Harry's songs woven in. They are light-hearted pop culture parodies tailored to kids like "Star Wars" and "Batman," he said. "The kids go in for the fun activity, but we always make sure they know why we're doing it and what it's for." In addition to the ongoing LUNCH performances, Bill has served as music director at Camp Wightman for the past eight years. "We'd been doing a lot of programs in area churches, and one minister/musician wanted to start a music camp for younger kids in grades three through six," Pere said. We began with a couple of the LUNCH kids and it really worked. It's fun and a place where kids can get together with other kids away from other issues." This year, Pere said, they had about 40 campers, and some of the counselors were young people who'd previously been campers. Pere sees the same enthusiasm in the LUNCH ensemble participants whose siblings and parents get involved and have become the backbone of the programs. One of the greatest rewards for Pere is to see participants later get involved as volunteers in local social service activities. Sometimes they come back to advise kids and become liaisons with businesses, he noted. "It gives them confidence and self-esteem. They aren't afraid to talk in front of people. Kids write about LUNCH in their school assignments, and one said it made her so much more aware of the needs of others." LUNCH has a year-long schedule of events to celebrate its upcoming anniversary including concerts, a songwriters conference with Jen Chapin, and a Hunger Awareness Day in March that Perehopes will be the start of an ongoing program. For more information about LUNCH's programs and schedule, go to their website at http://www.lunchensemble.com/. LUNCH CDs also can be ordered through this site.